Every country has to announce a teamleader- this teamleader is resonsible for the registration of each participant of this country. If you do not know the teamleader of your country or you have any further questions, please send an email to Dr. Sabine Hampel (hampeldr@gmail.com). She will help you with your registration. 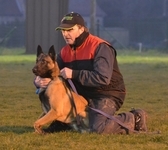 Organizing club: Deutscher Malinois Club e.V. the registration of the teams.